« Sixteen years ago today…my new life..
A dear friend and I were talking this morning about how different members of a family see things. With our old age wisdom we can accept it, but it’s one of those things you learn as you live. I remember, as an adult, talking to my mother about something that had happened years before and she said, “that’s not what happened, at all,” and proceeded to tell me her version, which was shocking and slightly annoying. It was interesting to get the different perspective, so I just added to my own memory of the event. As a mother of four, I became keenly aware of how differently my children saw things. Each has his or her own personality and ability to process what is going on with their age, position in the family, and accompanying life experience and level of maturity added on to skew the event even more. A child of ten sees an event differently than a child of fourteen or sixteen and differently than an adult. I’m assuming everyone figures this out at some time, but it’s always funny or strange to hear someone else tell their version and have it seem so incredibly different from our own. Sometimes, everyone tells it so much that all the stories become a more cohesive party of family history. The importance of this is that we all need to respect each other’s truths. Just because it varies from ours doesn’t mean it isn’t valid. It’s valid to that person and is how they are processing life and its lessons. It’s also important for all of us to not only respect but watch for the things that may skew that person’s truth into something far away from how everyone else saw it. Easier said than done. We all look back and think we should have seen something that hurt someone or should have been more understanding or even looked at something more broadly ourselves, but it’s always looking back. And we probably did do the right thing at the time with what we knew then…hopefully. I even look back sometimes and am sorry I can’t remember a special fun moment better because I just wasn’t paying attention. That’s another lesson…something that may be memorable to us may be totally forgettable to someone else. Photos are important to me to jog my memory or to catch an expression later on and wonder what in the world was going through that person’s mind at the time. 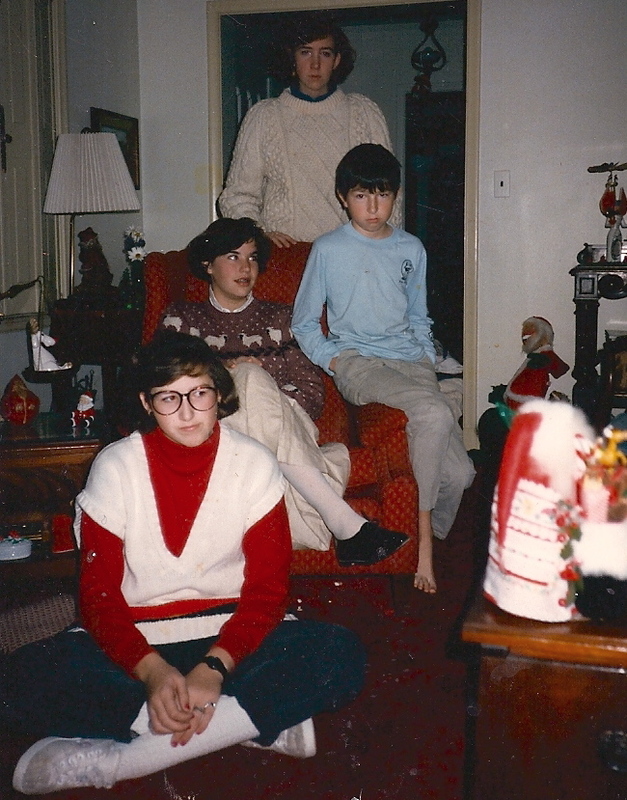 I’m going to end with this one of my kids on a probably fun Christmas long ago. You’d never know it was fun now, would you? I’m assuming they were annoyed at me for taking one more picture, but who knows? Regardless, I love them for expressing it rather than giving me a fake smile. This is so much more true, isn’t it?